So when your editor says your chapbook will most likely be out in November, you figure there’s a 75% chance that will actually happen, a 20% chance it will be out in December, and a 5% chance it will be some other time, like January or February, or maybe part of a two-year backlog. What you don’t expect, or at least I didn’t, is that the chapbook would be out in early September, a full two months early, and both look and read with the quality you expected it would when you expected it to be out in November. I can’t say enough how much I appreciate Blue Cubicle Press and its publisher, David LaBounty. And even if you couldn’t care less about some chapbook titled, Something L.A., the press has a great collection of work-themed books, chapbooks, and journals. All worth reading unless, of course, you’re Paris Hilton and you’ve never actually worked a day in your life. Then, all that stuff about work and the various comedies and dramas that play out in that world may just seem alien to you. And if you’re not averse to a chapbook about interning at an advertising agency in L.A. and meeting a few famous people in a rather awkward way, here’s the link to that: Something L.A. 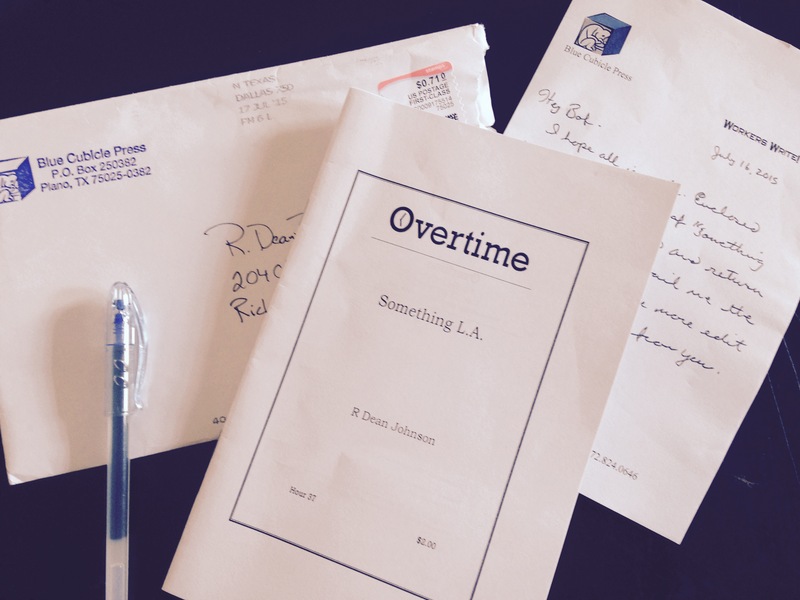 The proof for my creative nonfiction chapbook, Something L.A., arrived on Monday. (It will be out in November 2015 as part of Blue Cubicle Press’s, Overtime Chapbook Series). I was excited to see it, then worried about line editing, then excited again when I started the edits because I really love this essay. Today the line edits are complete and on their way back to the editor, David LaBounty, and I’m still excited about this project. Hooray writing!